NIOS restaurant at Kimpton’s The Muse hotel will be hosting the second annual “Eat Like a Man” Competition on Tuesday, November 19 starting at 5:30pm, being held to coincide with Movember to help raise awareness and funds for men’s health issues (www.niosrestaurant.com; 130 West 46th Street). The night will kick off with a reception hour where guests can enjoy signature cocktails such as the Mo’Hattan and Old Fashioned Mo. 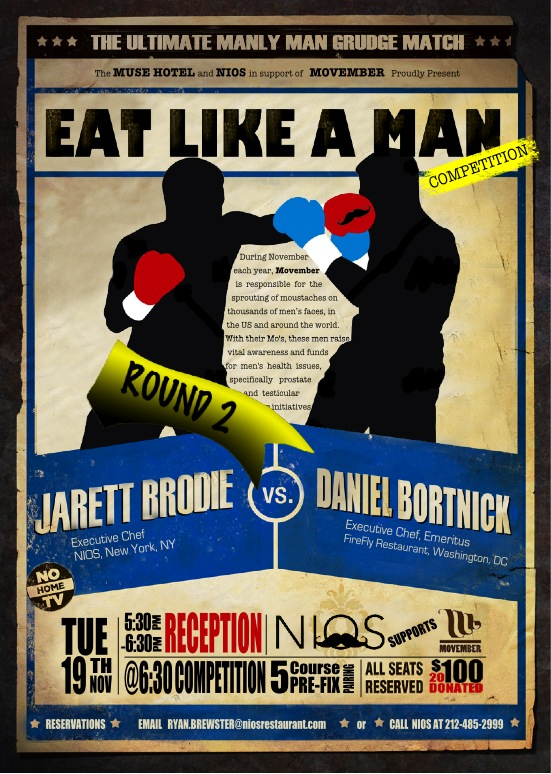 The hour will be followed by the ‘Eat Like a Man’ competition featuring the manliest of cook-offs between New York native chef Jarret Brodie of NIOS and Danny Bortnick, DC Chef and Kimpton Senior Director of Restaurant Concept and Development. Guests will have the opportunity to vote for their favorite “manly” dishes, featuring a five course prix fixe menu complete with beer and wine pairings and featuring plates such as Crispy Pork Belly and Diver Scallops with apple rosemary puree and mache salad and Roasted Black Cod, fava bean pesto, chanterelle mushrooms and bacon glazed fingerling potatoes. TICKETS: $100/person (all taxes and gratuity included) with $20 being donated to Movember. For reservations, contact NIOS at 212-485-2999. This is awesome, a great way to raise awareness about men’s health and coincide with Movember. I only wish I could attend. The menu looks mouth watering and I love the ingredients being featured. Yes, definitely going to try to attend this!